Mental Health Awareness was vital to my survival. Mental Illness Awareness is essential to my life. Self-care will always be my solution. Mental illness became a part of my world at an early age and as a fourth-grader, I had no clue how to handle it. I would grow up confused, hurt and angry because the one parent that was in my life had been diagnosed with paranoid schizophrenia. Although I would go on to graduate high school and college, I had to do it without my mother’s guidance and little support from my family. It wasn’t until many years later that I really began to feel the effects of having to be strong, independent and silent. It wasn’t until I reached out for help that I understood that guilt, shame, and feelings of abandonment were to be expected and that I had to learn healthy ways of coping with these feelings. Once I scraped up the courage to speak with a therapist, I was able to get rid of the resentment I held towards many members of my family and towards my mother. Little did I know this was just one layer of many that I would need to shed in order to be my best self. After I began repairing myself, I was able to handle repairing the relationship with my mother. The relationship with my mother would have remained broken if I never took the time to understand her illness and the effects of growing up in a family that did not talk about her illness. The ability to separate my beautiful mother from her illness is what saved our relationship. The ability to understand the difference between my mother and the symptoms of schizophrenia, saved ME. The process that began with me and a therapist would continue on with me reading books about schizophrenia, and then participating in NAMI’S Family to Family class. The class showed me that I wasn’t alone and that my feelings of anger, shame and guilt were common when a family member is diagnosed with an illness. After the twelve week class I was not ashamed nor angry and felt less guilty. (There are still times those emotions come up, however, I’m better at practicing self-care when they do.) I then had to courage to share my story with others and speak about the importance of mental health awareness, mental illness awareness, and self-care. Speak Away the Stigma is the result of that courage. I know first hand that the stigma that is associated with illnesses that affect the brain is real. I also know that only through discussion and sharing personal stories can the stigma be diminished. Let’s share our stories to increase awareness! Let’s Speak Away the Stigma. 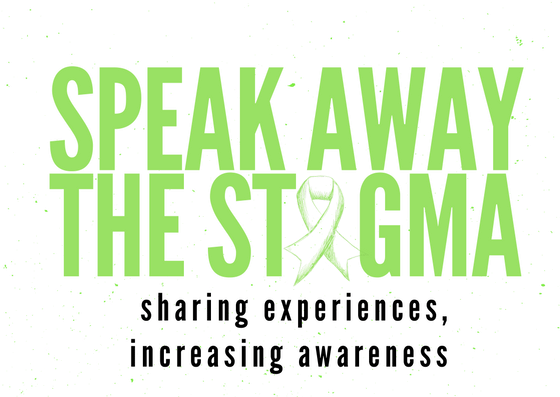 Email me with any questions, speaking request, or to share your story at speakawaythestigma@gmail.com. Please consider making a donation to help keep Speak Away the Stigma! I love sharing stories and spreading awareness, but I need help to keep it going. Click here to show your support! I want to know when Speak Away the Stigma has a new story or a new event! Enter your email address to follow this blog Speak Away the Stigma and get notified of new stories and events!.